How Evenly Distributed Is Your Daily Bible Reading Plan? 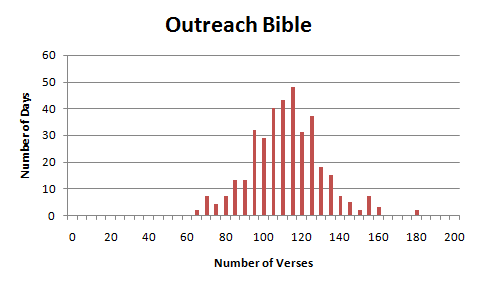 A perfectly evenly distributed Bible reading plan would have you read about 85 verses each day to get through the Bible in a year. 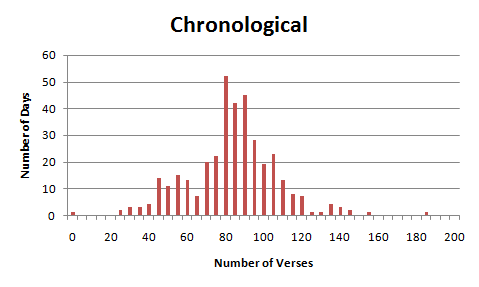 The Bible doesn’t break up into nice, logical 85-verse sections, however, and reading-plan designers have to decide when to vary from a strict 85-verse-a-day schedule. For example, they’ll often have you read complete chapters in a day, which differ in length. These two plans tend to have you read roughly the same number of verses every day. These three plans are somewhat more inconsistent. 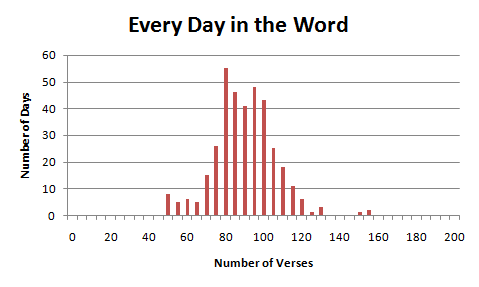 These two plans significantly vary the number of verses you read each day. 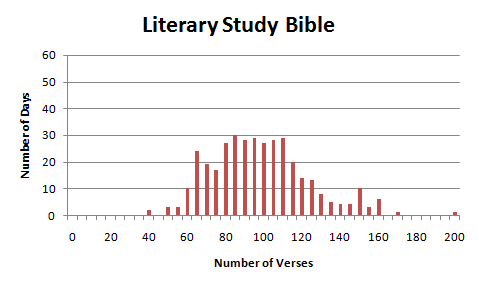 (At the extreme, on April 29, the Literary / ESV Study Bible plan has you reading over 200 verses.) 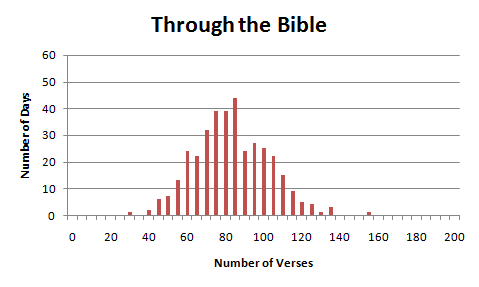 However, as I understand it, the idea behind the Literary Study Bible reading plan is to have you read literary units each day, so this variation could be by design. This entry was posted on Thursday, January 1st, 2009 at 9:39 pm	and is filed under Bible. You can follow any responses to this entry through the RSS 2.0 feed. Both comments and pings are currently closed. 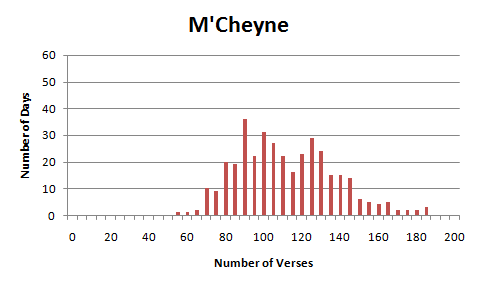 Very nice; I’ve wanted to do something like this myself but I’d forgotten all about the ESV API… my plan was to note the number of verses in each day’s chapters and populate my own database at the end of the year… your way is much more efficient! I read daily, but not a strict amount. I find a subject that interests me and I chase down the applicable verses until I think I understand it better. Then I write my understanding down in a post so as to solidify my thoughts. It helps me a lot. I post on sawboyrick.pnn.com. It gets habit-forming. I can’t wait to pick my next topic.